Implemented measures resulted in a decrease in emissions of particulate matter and nitrogen oxides since 1990, despite an increase in the number of vehicle kilometres. Carbon dioxide emissions have decreased slightly since 2009 due to more fuel efficient vehicles. Because of the recovery of the economy since 2015 the emission of carbon dioxide increased slightly. Between 1990 and 2008, carbon dioxide (CO2) emissions from road traffic increased more or less in proportion to the number of vehicle kilometres. Between 2008 and 2014 the emission decreased by 15 per cent, which is among other things due to the fiscal benefits of purchasing fuel efficient cars. Between 2014 and 2017 the emissions have increased by almost 4 per cent due to the increase of traffic. Emissions of nitrogen oxides (NOx) and particulate matter from road traffic decreased year by year after 1990, despite the fact that the number of vehicle kilometres increased by 41 per cent between 1990 and 2017. In the case of NOx, this can mainly be attributed to the introduction of the three-way catalytic converter in cars and vans at the end of the 1980s in response to emission standards. The reduction in particulate matter (PM10) emissions was mainly due to improvements made in engines. A further reduction, in particular after 2005, was achieved by the use of diesel particulate filters. From 2011 onwards almost every new diesel vehicle contains a built-in diesel particulate filter, and many existing vehicles were retrofitted with particulate filters. Over 80 thousand cars and vans and almost 27 thousand heavy duty vehicles have been fitted with a retrofit filter. In 2017 30 thousand and 7 thousand respectively were still active. The general policy objective is to achieve a decrease in emissions across the economy, alongside a growth in gross domestic product (GDP). CBS, PBL, RIVM, WUR (2019). 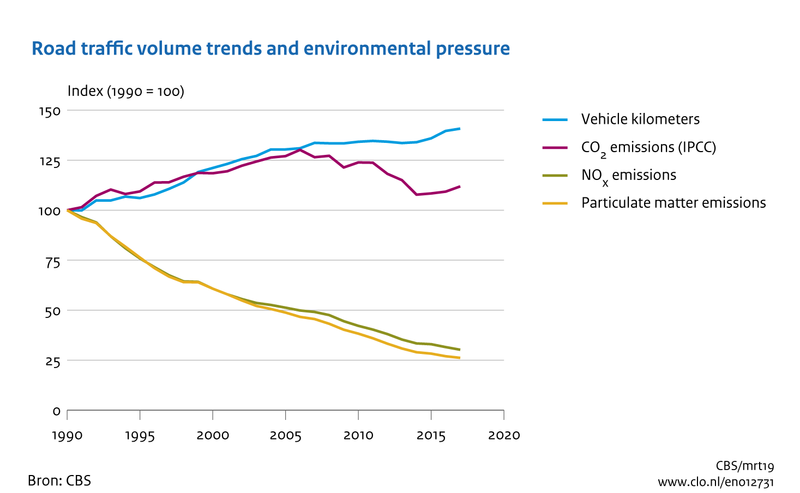 Road traffic: volume trends and environmental pressure, 1990-2017 (indicator 0127, version 31 , 4 April 2019 ). www.environmentaldata.nl. Statistics Netherlands (CBS), The Hague; PBL Netherlands Environmental Assessment Agency, The Hague; RIVM National Institute for Public Health and the Environment, Bilthoven; and Wageningen University and Research, Wageningen.